This post is sponsored by Willow House. Joy Crile from Willow House. If you haven't heard of Willow House before, have I got a treat for you! And if you have heard of Willow House...I still have a treat for you! Willow House is a great online home decor shop, and Joy is one of their fabulous consultants...she actually introduced me to Willow House...and I'm so glad she did. They have some absolutely beautiful products. 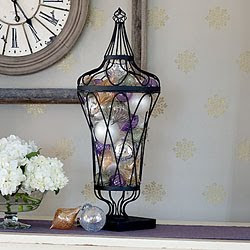 I just love this Framework Urn...especially the way they've displayed it here filled with pretty ornaments! 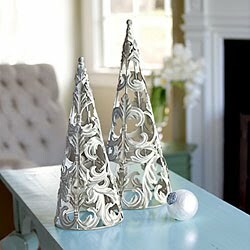 And while we're on the subject of Christmas Decor...I love these Christmas trees. They'd be perfect with my silver and white decor this year. And if you love entertaining, they have wonderful serving pieces as well...like these Tuscan Sage bowls filled with chips and dip. And check out this adorable memo board. I'm just loving it! Right now at Joy's Willow House shop you can enjoy the Very Merry Markdown Sale where you can score some great deals just in time for Christmas giving...and anything purchased by December 15 has guaranteed Christmas delivery! And today, Joy would like to offer one reader of the Shabby Nest a $50 Gift Certificate good toward anything in her shop! All you have to do is hop over and visit Joy's Willow House website, then come back here and leave me a comment saying what you'd use the gift certificate on should you be the lucky winner. For a second entry become a follower of Joy's blog, then leave me an additional comment saying "followed" or something like that! This post was sponsored by Willow House. The opinions expressed are 100% mine. Oh I love the Morningside Caddy! Too cute and practical! I love the Gramercy Casserole Caddy. It is the perfect party dish! I would use the certificate toward the vintage spiral tree...oh, I love it.. Ooooh...I love the framework urn too! I would definately get that. Thanks for the chance to win. Okey dokey, I am a follower on Joy's blog. I would use the certificate towards the small Lady Jane Bottleneck Vase! I love this type of thing. Woo-Hoo! Another blog to follow. I am now following Joy's blog. Thanks for the nudge! I would get the covington serving tray! I love serving trays-Covington Serving Tray would be my fave. Over the years I have been a faithful Southern Living at Home customer (before they became Willow House) and I will continue to shop from their beautiful array of quality products. Too many thing to choose from! But the Hyacinth Ramekins are at the top of the list. I love the Gail Pittman: Alfresco Loaf Pan & the Deep Dish Pie Pan! What a cute company. I am in love with so many things they sell but the Royal Street urn is my favorite since I've been looking for one like this for a while! I am also a new follower of Joy's blog! And I saw an outlet section! Wowsers great prices! We are redoing our bathroom and the Sutton Vanity Set would be perfect! Thanks for the opportunity. I love the memo board!! I love the beverage serving set. So many cute things to see! I loved the Southern Sippers small bowls and so many other items too! hey I'm a follower:) and there is piles of stuff i love on willow house! the pillows! some of them are charming!!! I love the big green Bottleneck vases! I love the Roxy Reindeer Party Plates! I may have to buy them! I would get the French Wire Tiered stand! So cute and versatile! There are so many pretty things....I'd probably start with a celebration cake stand or the Lady Jane bottleneck vase. It's hard to choose, but I think I'd pick the Gail Pittman: Alfresco Loaf Pan and maybe the Gail Pittman: Alfresco Deep Dish Pie Plate to match! Lots of things to love, but I love old world design of the Carrigan wine stoppers, they would look great in an old vinegar bottle I have. I also love the ruffly aprons! So many other things that I could choose too! Thanks for doing this giveaway! I like the Gramercy Casserole Caddy. Thanks for the giveaway! 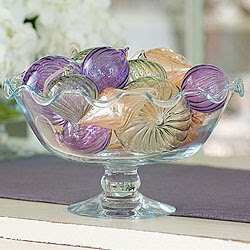 I love the Hyacinth Bowls!! Pretty! Love the whole Galveston collection...would look so cute in my house! I now follow Joy's blog. So much pretty stuff. I love the tuscan tumblers, as well as the glass domes. I would get the glass domes! I would love the Deep Dish Lasagna Pan! I'm a new follower of Joy's blog! 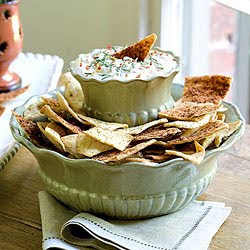 Love everything with ruffles, bowls included! I am loving the trilogy mirrors they are so stunning! I'd go with the deep dish lasagna pan. Love that blue! I love the Ruffled Glass Pitcher! So pretty! I love the ruffled glass pitcher. Ooohhh...I've been drooling over the French Wire Tiered Stand for weeks! Thanks for the giveaway! Very hard choice! I like so many of their things, but I think I'd have to go with a new canister set or maybe the Galveston tray! There are so many fun things, but I would choose the French Wire Tiered Stand. I LOVE Willow House! I have an ongoing wishlist. I think the French Wire Tiered Stand or the Memo Board would be at the top of my list! That framework urn is beautiful! I would choose the Morningside Caddy or the Galveston Memo Board. REALLY hard to decide. They're all beautiful! Thanks for the giveaway. Hopefully Wendy you can get those trees. They would look lovely in your home. I really love the galveston stand. I could see that in my home. So many great gift ideas. Love the Gramercy Ribbon plate... but I just bought that. :) I think I need the Gramercy casserole dish to match! Love, love, LOVE the Jolly Holiday Table Runner! It's the perfect colors for my decor this year. And another follower of Joy...this could be dangerous!!! I looooove Willow House! I would so love that memo board. That would look great in my house. Thanks for sharing her with us. What a great giveaway!!! I know exactly what I would use the gift certificate on....the French Wire Tiered Stand. I'm a folower of Joy's blog. I would love to buy and use the Roxy Reindeer serving plates. . .so cute! Thank you so much. I am a new follower to Joy's blog! OK, so it's a tie between the "Drake Firefly Lanterns", "Sedona Sconce", and the "trilogy mirrors". So many fun things!!! I recently found out about Willow House and love their stuff. I would have to go with the Hathaway Bath collection items. I love the towel bar, towel ring and the tissue holder. I am a follower of Joy's blog. I'd get the Vintage Spiral Stand. Or maybe the Cinnabar Appetizer Tray. No, I'd get the Cinnabar Baker! Ohhhh maybe the Galveston Memo Board and Must-Have Holder. OR...the Drake Firefly Lanters. Oh geez I can't decide!!! And don't get me started on ALL of that wonderful Gramercy stuff! I am now a follower of Joy's blog! I would use it to buy anything from the Belle Meade collection. The items are so simple but still beautiful!